Kicking off Summer Reading 2018 with LADY CHOPS! Tuesday, May 29th @ 6 pm at the main library in Ville Platte. 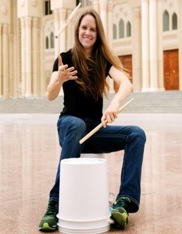 Lady Chops aka Elizabeth Vidos performed in New York City with STOMP for 10 years and she is a phenomenal DRUMMER! This is a one time showing so please share the good news! This event is sponsored by the library Friends of the Library and Cabot Corporation and is FREE to the public.